I am an insurance broker, a wife, a mother of three kids, and the guardian for my two elderly parents. In my free time, I relax and escape from my regular responsibilities by volunteering to role-play victims for disaster drills. Last night, for example, I went to a mall in the town of Pleasanton, a suburb about 25 miles from where I live in Oakland, to role-play a victim in a six-hour active shooter drill. The scenario was that the guy robbed a bank, came into the mall, and opened fire. My role was that I was shot in the leg. Next to me, another lady who was also “shot” had blood all over her clothing and face. In these situations, first the police need to find the active shooter and then they tell the people who can walk to leave, and only after that do they tend to the wounded. So we, the wounded, just lie there on the floor, waiting and saying things like “Please, can you find my son?” The other lady and I agreed that in real life we could never just walk away and leave the wounded there. We’d try our best to take care of them. I really can’t imagine not trying to help people. I volunteer constantly: gardening, raising funds for AIDS, cancer, and Alzheimer’s. I prep and serve meals for the homeless at different churches and a pack groceries for the Open Hand Project. I sing Christmas carols at the Veteran’s Hospital. I am immensely driven to make the world a better place, but volunteering also makes me feel good psychologically and it has given me new friends and new skills and a chance to practice teamwork. As a volunteer I have a sense of pride and identity. 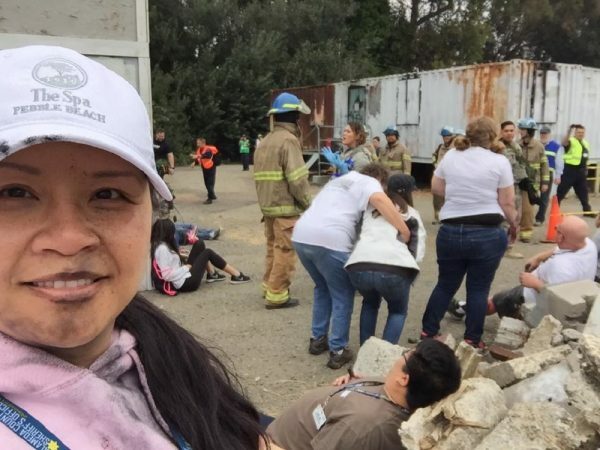 Jenny takes a selfie while other volunteers act out a disaster drill in the background. Still, my husband thinks that my volunteering at the disaster drills is a little crazy. “When are you going to take a rest?” he says. He knows I won’t. Doing disaster drills allows me to give back to all of the people who have helped me over the years and it also helps me feel safer. This may sound funny, but doing the drills actually helps me sleep better at night. 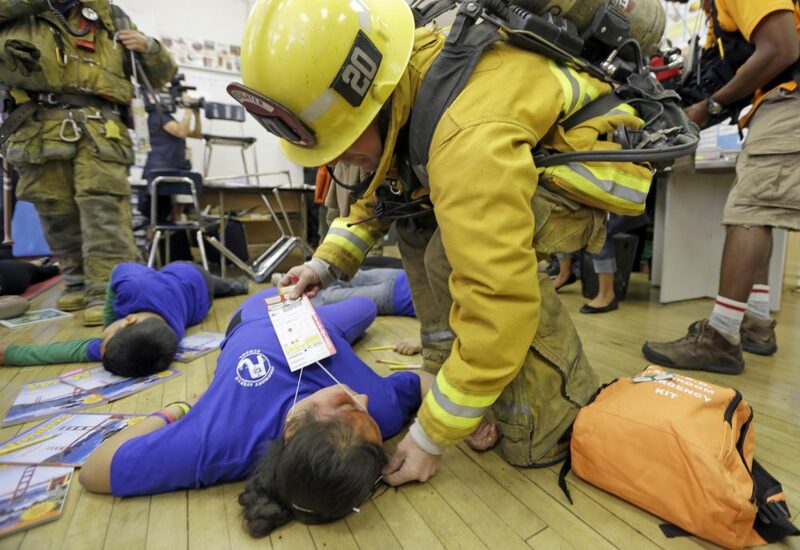 Disaster drills are intentionally scary. They are simulated acts of violence with injury and death in a safe, but realistic setting. Recently, four EMTs were carrying me on a stretcher, but two of them were called away to help other victims, so only two were left to drag me the rest of the way to the Medical Triage Command Post. Once I was there I had to pretend I was going into shock: I told them I was freezing even though it was pretty hot out. They put a splint on my leg and put pressure on the “wound.” The EMT student and his coach talked to me to keep me awake, checking my pulse, my breathing, and applying pressure onto my wounded leg to stop the bleeding. The EMT triaged me as “IMMEDIATE” with a Red Tag. 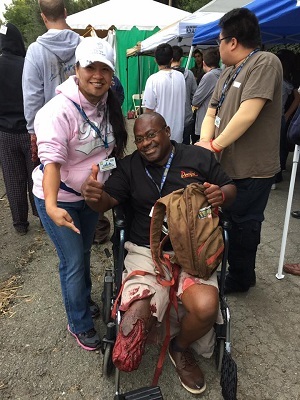 Jenny with a fellow ‘wounded’ disaster drill volunteer. At least I wasn’t dead! If I were, I’d have been tagged with a black tag and taken to a different tent. 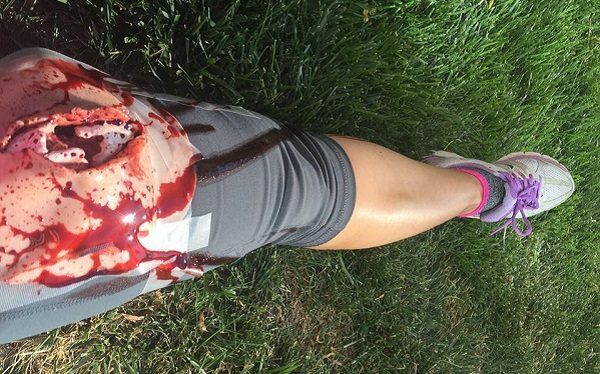 The worst injury I ever had was for the FBI at Levi’s Stadium: both my legs had to be amputated and there was blood everywhere. They put sneakers with “my feet” in them near me. In another drill that I did for the fire department, there was an explosion and I got hit by the guts of the suicide bomber. Some people who volunteer feel extreme anxiety in these situations and have to drop out. Not me. I was born in Cambodia and have already seen the worst. The Khmer Rouge took over the country when I was a toddler and I lived in a concentration camp until I was six. When the Khmer Rouge fell, my sister found me and we escaped death by running at night and hiding among corpses during the day, eating leaves or bugs or whatever we could find. We finally reunited with our mother but she was killed by soldiers later that same day when she went out to gather food. Life is cruel and unfair: there are so many things I still want to learn from my mother. My sister and I made our way across the country alone. Sometimes people helped us; sometimes they were indifferent; a few tried to harm us. Finally, we found my father on the border of Vietnam. We then escaped to a Thai refugee camp and later moved to the U.S.
It’s been many years since my childhood, and one of the things I think about a lot is how to take care of my family. I wonder how they would survive if they lost me. Before the 2008 economic crash, I invested in life insurance so that my children would be okay if I died. But after the crash, we lost our homes and we went to live in my sister’s house in Oakland. 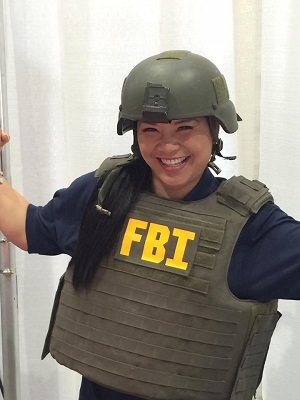 Jenny tries on an FBI vest at a training. I began participating in disaster drills because I wanted to take care of my family. My dad has been confined to his room and a wheelchair for a couple years. Last October, my mother-in-law also moved in with us. If there were an earthquake or a major disaster, I know that my son, 12 years old, will be well taken care of by the school and my two older kids, who are in their 20s, will be able to take care of themselves. But neither me nor my husband would be able to get to our parents because I work 29 miles away in Pleasanton and my husband works in San Francisco, which is across the bay from Oakland. 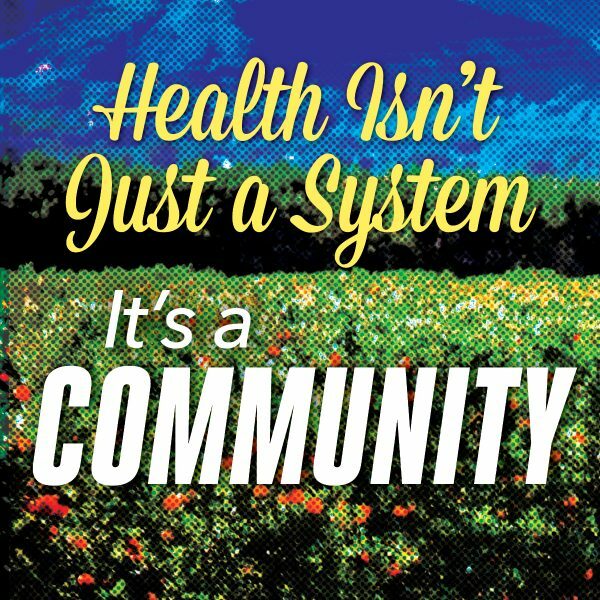 I started off taking courses from Community Oakland Response Emergency in Oakland followed by the Community Emergency Response Team in Pleasanton. In these classes I learned how to fight small fires, do light search and rescue, understand the psychology of disasters, and do medical triage. Once you make the commitment to emergency preparedness, there’s a lot of opportunity to progress and strengthen your skills. Later, I received an invite to participate in the Citizens Police Academy which met for three hours once a week for seven weeks. Then I was nominated to participate in the FBI’s Citizens Academy. The police and FBI academies also explained how crimes are investigated and included firearms training. As I learned more I realized I needed to learn to use a ham radio. When there’s a disaster the cell and landlines won’t work. With ham radio you can find out what’s going on and reach the rescuers. I took a course in ham and then took the FCC test and got a license. I joined the Livermore Amateur Radio Klub and the Oakland Radio Communications Association, which meets at the fire station around the corner from my house. If all communications are down, I’m hoping that if there’s an emergency I can use the radio to reach the fire station near my house so they’ll check on my parents. Jenny’s ‘wounded’ leg from a disaster drill. I’ve met so many good people through these classes and drills and some have become my mentors. They have good hearts. When I talk with them I feel like I can trust them. From FBI agents to neighborhood watch captains, I’ve made a network of new friends. A few weeks ago I needed to renew my son’s passport quickly and ran into trouble at the passport office. I called an FBI guy I knew from the drills and he suggested that I call my senator’s office. I said “Who am I? I’m a nobody.” He said, “Are you a citizen? Then you’re somebody.” We got the passport taken care of the next day. Volunteering offers vital help to people in need, worthwhile causes, and the community, but the benefits can be even greater for us, the volunteers. Volunteering can also help reduce stress, combat depression, keep us mentally stimulated, and provide a sense of purpose. I have had so much help along the way to my life today. Whatever I can do to help—it makes me happy to help people and give back through service. When I’m going to sleep I feel good about it. If I have seen someone who needed help that day and failed to offer to help them I can’t sleep. Jenny Chea-Vaing is a resident of Oakland. She will receive a Jefferson Award for public service in the fall of 2016. *Lead photo by Reed Saxon/AP Photo. All interior photos courtesy of Jenny Chea-Vaing/Facebook.